F.E. 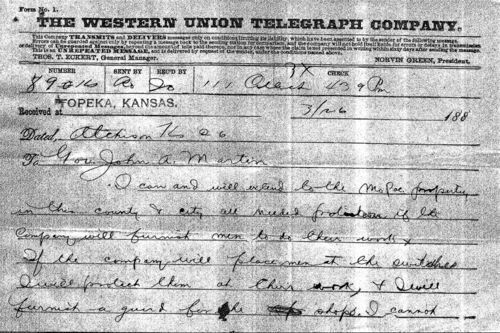 Shaw, Sheriff of Atchison County, writes Kansas Governor John Martin of Topeka regarding striking railroad workers. Shaw states that he will protect the railroad property that belongs to the city and county if the railway company will supply men to do the work necessary to get the trains running. The railroad strike of 1886 occurred after reports of layoffs affecting Missouri Pacific workers in Texas reached the railroad engineers and shop workers in Kansas. Although the governor had been successful in negotiating the end of an earlier strike in 1885, problems continued and public support waned.